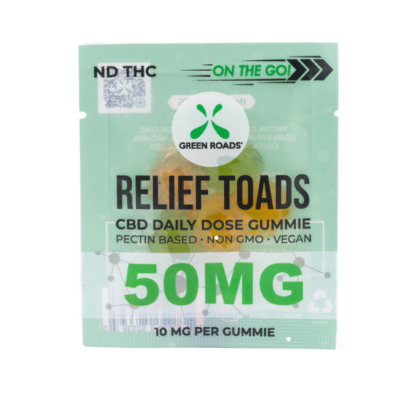 Green Roads Relief Toads offer a delicious and chewy way to help you cope with different levels of anxiety and discomfort. If you are suffering from back pain at work or if stress is keeping you up at night, these relief toads may provide the solution you have been looking for. The sweet and tropical taste combined with the new practical packaging of these on the go CBD candy toads will have you leaping for joy. Like all Green Roads items in our collection, these on-the-go relax gummies are made with pure CBD extracted from industrial hemp cultivated in the United States. All Green Roads products have been formulated by a licensed pharmacist with decades of experience in the industry and have been lab tested to ensure potency and purity.